Overview : The PLAYSTATION®3 Blu-ray remote control enables users streamlined access to the PLAYSTATION®3 system's disc features. Unlike standard infrared remotes, the Blu-ray remote control uses Bluetooth technology so it can be used without having to point directly at the PLAYSTATION®3 system. Quality/Usability : Putting the console aspect on the side and the PlayStation 3 is the best Blu-Ray player on the market. If you're reading this review, then you probably already have the PlayStation 3. You're also probably using the SIXAXIS or Dual Shock 3 to navigate the Blu-Ray disc menus. Since the PlayStation 3 has no built-in IR, its all bluetooth that will be doing all the communicating. So if you have a universal remote, it wont work. But there is a solution that I'll talk about later. The PS3 Blu-Ray remote looks like a typical DVD remote, runs on two (2) AA batteries and allows you to navigate menus and controls. The remote measures approximately 8.5” long, 2” wide and 1” thick. It weighs in at 3.7 ounces (103 grams) or 5.0 ounces (135 grams) with batteries inserted. The remote sports 51 different commands. There is no dedicated ON/OFF button like normal remotes but to turn ON/OFF your PlayStation 3, there is a PS button just like on the SIXAXIS/DS3 controller. Press once to turn on the PS3. Press and hold the PS button for a couple of seconds and select "Turn off the system". You can also turn on the PS3 just by pressing any of the buttons on the remote. Every button that you would find on a standard DVD remote such as Play, Stop, Next, Prev, Scan, Audio, Subtitle, directional pad, Enter, are all here. Everything you'll find on a PS3 controller is here as well such as Select, Start, L1-L3, R1-R3, X, O, Triangle, Square, etc. The remote also has an Eject button. Since the remote is bluetooth, you'll have to pair it to the PlayStation 3. 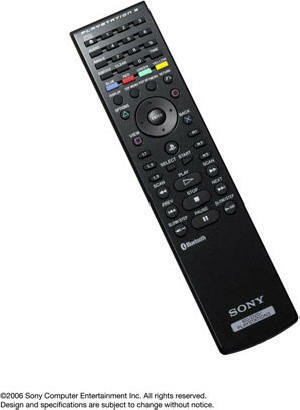 Unlike traditional IR remotes, you do not have to directly aim the remote at the PlayStation 3. The response of the remote is very quick and has a 30 foot range. The remote feels comfortable in the hands although fairly long. What would of been nice was adding backlight to the remote buttons. Conclusion : Overall, the PS3 Blu-Ray Disc Remote works great. Since its blutooth, you can only use this with the PlayStation 3. There is no IR so you wont be able to use this with any other home theater equipment such as your receiver or TV. At the time of this review, I dont know what the Red, Green, Blue and Yellow buttons are for on the remote but I assume it will be for the interactive stuff when it becomes available. One thing that can be annoying is the fact that any press of a button, even if accidental, the PS3 will turn on. As mentioned in the beginning of the review, I mentioned a solution for those with universal remotes. You can check out our review on the PS3IRX1 IR Receiver Remote Adapter. Although you can use your universal remote and control the player on the PS3, there will be some lack of supported functions as that is the main drawback with any IR receivers. So if you have a big Blu-Ray library, this will definitely come in handy as the IR method does not support all commands. If you dont, stick to some IR methods for your minor usage but will cover the most important commands needed. Hopefully, a company will come up with a IR to bluetooth option for those with universal remotes.